Conservation groups are fed up with the U.S. Fish and Wildlife Service continuing to use the photo of a particular Mexican wolf as their “poster wolf,” after they trapped and accidentally killed her back in 2005. SILVER CITY, N.M.­ Sixteen conservation and animal welfare organizations today asked the U.S. Fish and Wildlife Service to replace the photograph of the “poster wolf” of the Mexican gray wolf program – prominently displayed on the federal agency’s website, http://www.fws.gov/southwest/es/mexicanwolf/, and in a oversized blowup poster at the agency’s Washington, D.C., headquarters – because the wolf was trapped and inadvertently killed in 2005. (Click here to read letter to the Fish and Wildlife Service). “Brunhilda,” alpha female of the Francisco Pack of Mexican gray wolves. Photo by George Andrejko. The wolf was one of at least 2,911 gray wolves killed as a result of Fish and Wildlife Service actions since 1996, most in the northern Rocky Mountains and upper Midwest, but also including 29 highly imperiled Mexican gray wolves in the Southwest (see attached charts). This month, the federal government shot all 27 members of the Hog Heaven pack in Montana, the seventh wolf pack in the state wiped out in its entirety this year. 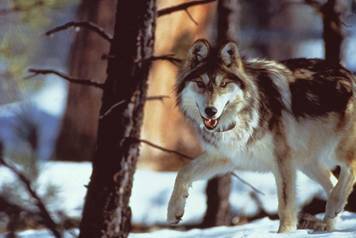 The killings in the northern Rockies have rendered wolves in Yellowstone National Park almost entirely genetically isolated, threatening their viability and preventing the northern Rockies wolves’ recovery. There are now only about 50 Mexican wolves in the wild – a population that scientists say is already undergoing debilitating inbreeding depression. The “poster wolf,” alpha female number 511 – also known as Brunhilda, named for the figure in Norse mythology because of her large size as a pup – died of “capture myopathy” (stress and overheating) on July 21, 2005, three and a half weeks after she was trapped and taken into captivity. Brunhilda was one of the original 11 Mexican wolves released in March 1998, and the last to roam freely from among those 11. The photo taken by Arizona Department of Game and Fish photographer George Andrejko of Brunhilda stepping out of a pen into freedom won the department an award and was made famous as a poster. The photo also adorns the Forest Service’s map of the Blue Range of Arizona, where she was first released. “The U.S. Fish and Wildlife Service has a responsibility to accurately portray its management of the Mexican gray wolf,” said Michael Robinson, conservation advocate with the Center for Biological Diversity. “The agency’s heavy-handed tactics have resulted in dozens of Mexican gray wolf deaths and a struggling population.”. Brunhilda was one of 18 Mexican wolves – the tally so far – killed inadvertently as a result of capture (see attached list). The government has shot an additional 11 wolves, and 22 have been consigned to permanent captivity. Brunhilda’s mate is one of two wolves whose legs were amputated as a result of trap injuries. One of their litters of five wild-conceived pups died from stress from the noise of a construction project near their pen, in June 2003, as a result of an earlier bout in captivity. Brunhilda was trapped from the wild three times for having left the arbitrary bounds of the Mexican wolf recovery area, and once later for preying on cattle after first having scavenged on the carcasses of cattle she had not killed. Both reasons to trap her would have been prevented if the Fish and Wildlife Service had followed scientists’ longstanding recommendations and reformed ill-conceived policies of the reintroduction program. “What we are seeing now is wolf ‘management’ through the barrel of a bazooka,” said Brian Vincent of Big Wildlife. The Mexican wolf reintroduction program in New Mexico and Arizona began in 1998. The wolves were projected to reach 102 animals, including 18 breeding pairs, by the end of 2006 and to continue increasing from there. The actual numbers for the end of 2007 were 52 wolves, including just three breeding pairs. The 2008 count will take place in January. Great quote! Wolf management through the barrel of a bazooka. It is also quite disturbing to think that instead of Raul Grijalva, the Mexican wolf will have the likes of anti-ESA Ken Salazar as Interior Secretary. May the curse of Brunhilda fall upon him, and he decide even before it is time for Confirmation Hearings, that he needs to spend more time back on the ranch, with his cattle. So after Bush, Cheney, Kempthorne et al. de-list wolves in the northern neck of the U.S western woods once again – WHAT does anyone think that Ken Salazar, replacing Dirk K. as he slides home to that bastion of ignorance and environmental destruction that is Idaho, will do in 2009? Will there be an immediate EMERGENCY RE-LISTING the day after Obama takes office? Maybe folks need to be getting a Citizens Petition, on-line sign-on/something prepared. What will Salazar do? What would Grijalva have done? One can only hope that reason will prevail in the Obama administration. I have not heard this term before. What does it mean, that Brunhilda just gave up, her spirit broken? Also, the letter describes how her litter died from stress of construction right by the cage where she was held in another bout with captivity. The reason this all happens – killing and constant trapping of Mexican wolves -is the greed of a small number of public lands welfare ranchers who will not tolerate native predators, and the Interior Department’s failed (on purpose?) policies. Killing species both outright and by policies. That’s the gist of it. Notice that most of the deaths did happen in captivity. Wild animals belong in the wild and humans, regardless of what we think we know… do NOT know better. It’s the same lie we used to destroy the Native Americans… and we used religion as the excuse. The pope helped by claiming that, since they weren’t christians, they weren’t human either so it was okay to kill them at will so they could “meet their maker”. Sound familiar? Wolves aren’t supposed to run wild, that would make the business model less efficient and profitable. Capture myopathy is a syndrome that affects numerous species of wild animal–ungulates are often affected–after they are captured. If you plug the term into Google or another search engine, you’ll find technical descriptions of the malady. It includes hyperthermia, but also affects various organ systems, muscles, etc. A couple of examples from the Mexican wolf program, in addition to the case of F511, were the deaths of two Hon Dah animals following their recapture in 2006. A sub-adult male, m1018, was found dead in his pen within a week following recapture. His mother, AF1027, was found dead in her shipping kennel outside the Alpine field office the morning following her recapture. She was being held there overnight for a vet check prior to transport, but didn’t live long enough for the vet to get there and examine her. Capture myopathy doesn’t always act that fast. I know one biologist who says any death of an animal in captivity within a year of capture ought to be attributed to capture myopathy unless there’s some other obvious cause. The capture and placing of radio collars on wild animals is rampant in our national parks and wildlife refuges. Everytime I visit a park I see animals that are supposed to be wild and free being abused by being outfitted with these intrusive and death causing devices. Every third wolf in Yellowstone is treated in this fashion along with any wolverine, lynx. red fox, coyote or any other animal, that someone needing an advanced degree can convince park officials to allow them to put collars on. Any animal that dies in the first year after capture and released back into the wild should be attributed to capture myopathy. I read something on this blog about the wolves in yellowstone needing more collars. What they really need is NO collars. This insanity of studying animals to death in our parks and public lands must stop. I agree. This is one of the first confirmations that I have seen of what I suspected about capture and collaring causing death. Not only are predators dealt with in this way in YNP, it’s bison and elk too. It’s becoming rare to see “wildlife” in the park without collars anymore. Makes it more like a zoo every time I observe this. It’s just another way of assuming that we can control nature by studying it and monitoring it. Nothing is allowed to BE anymore without our watchfully paternalistic all-seeing-eyes attached to it. I suspect that this is due to our collective rationale that money can be made from it all somehow… once again, the capitalist model run amok. Michael Robinson has been fighting for the Mexican wolf almost alone since reintroduction. As I see it, he needs both financial and organizational help. Defenders were involved, but i have not heard from them in awhile. It is good to see WWP involved. More organizations need to be involved. Bill Richardson tried to help. But he did not have the clout to overcome FWS and the Bushies. Maybe things will change under Salazar.